It was some years ago that I first came into contact with Paul Collins. It was when he launched his first venture, the Australian science fiction magazine VOID. At the time Paul was a Queenslander and among his friends was Brisbane writer Frank Bryning, well known in the science	fiction	field both locally and internationally. Paul asked Frank for advice and for help in getting in touch with SF authors domiciled in Australia. So it was that I had a short story in the first issue of VOID and stories in succeeding issues. Then Paul became ambitious. VOID magazine was replaced by the VOID anthologies. As the magazine had done, these provided a much needed Australian market for the new writers just beginning to spread their wings - and we well-established wordsmiths are happy to see our work appearing in Paul’s hard covers. Among the well-known authors in this anthology is Cherry Wilder. Cherry, although she is now living in West Germany, is Australasian by birth. Her story CABIN FEVER, is beautifully told and the ingenuity of its ending is proof of her craftsmanship. Then there is David Lake, Australian but, as so often is the case, better known in the U.S.A. than in his own country. His OMPHALOS is a fine example of the art of saying a great deal - and saying it well - in a very few words. There is Jack Wodhams who, like myself, is an ex-Pom but whose stories have always possessed a very Australian flavour. However his THE HIDE is somewhat of a new departure for Jack, a clambering aboard the Bondwagon with a fine assortment of secret agents getting into each others' hair. But is it science fiction? Mphm. I should not be at all surprised to learn that the idea used by Jack has already been considered (at least) by more than one major power. The Australian born Wynne Whiteford gives us SAWDUST SUPERMEN - a very good story and a fresh twist to the First Encounter theme. Then there are the new, or relatively new, writers. Paul himself appears with THE GETAWAY STAR - a story that I have no hesitation in recommending as a thoroughly nasty little chiller. For those who like straight fantasy there is Trevor Donohue's THE TROUBLE WITH GRYPHONS - also a competent chiller at the finish. And no Science Fantasy anthology these days would be complete without at least one Sword and Sorcery story. Keith Taylor's THE LOST SHIP could be classed as such. Perhaps, however, a more accurate classification would be Sea and Sorcery. Anyhow, I liked it. All in all, this is a good collection. The Australian flavour of quite a few of the stories contributes to its value. It is encouraging to see that we, as a nation, are at last losing our cultural cringe. Even though the American distributors of MAD MAX (but many of the people involved in the film industry are madder than Max ever was) saw fit to dub in American dialogue most Australian movies shown overseas are now untampered with, and still play to packed houses. And, insofar as books and magazine fiction are concerned, editors in the U. S. A. and England now take Australianisms in their stride and no longer make clumsy attempts - and, by all the Odd Gods of the Galaxy, some of them were incredibly clumsy! - to convert dinkum Strine into English English or American English. In Australia Science Fiction has at last been recognised by the literary establishment. Not so long ago it was unheard of that a science fiction writer or publisher should get a share of the crumbs from the table of the Australia' Council. Suddenly the academics have realised that we are around - and have been around for quite some time - and can write as well as authors in other fields of fiction. Literature Board grants and fellowships are coming our way. 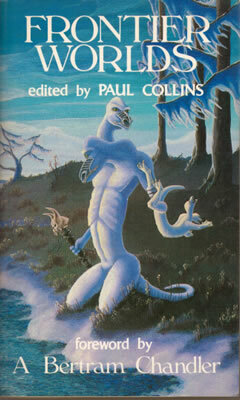 Paul Collins has played his part in the recognition of Australian science fiction by the cultural nabobs. I am sure that all of us, readers as well as writers, will wish this anthology, and the anthologies to follow, every success.